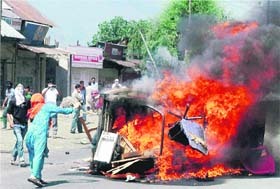 Violence in Kashmir escalated further today when eight persons, including a woman, were killed and over 60 injured in separate incidents with five of them perishing in a blast after explosives went off in a police station set afire by a mob. Should Warren Anderson be extradited? Twentyfour persons died after the truck they were travelling in lost control and fell from a hill into a 150-m-deep gorge. The truck (HR-55-E-2307) was coming from Uttarkashi to Gangotri carrying Kanwariyas and met with an accident near Dabrani. Buying bad wheat a habit with Punjab? Continuing with the �well-entrenched trend of corruption and mismanagement� in foodgrain procurement and storage, the food bowl of India- Punjab - this year, too, procured wheat that was highly substandard and damaged. There is uncertainty over the appointment of the first Vice Chancellor of the Central University at Jammu with the President yet to clear the panel forwarded to her for approval in April this year. Dubbed as the �wedding of the century�, former first daughter Chelsea Clinton married her longtime banker beau, Marc Mezvinsky, in a Saturday night ceremony out of bounds for the media. MAN & WIFE: Chelsea Clinton and her husband Marc Mezvinsky during their gala wedding at Hudson river estate in Rhineback on Saturday. Tourism sector in the Pink City today received a major boost with UNESCO granting the World Heritage status to Jantar Mantar, Jaipur�s celebrated astronomical observatory built in early 18th century. The promotion by Sri Lankan Tourism of a �Ramayana Trail� to attract Indian tourists has run into criticism from local historians and archaeologists who accuse the authorities of promoting a myth ignoring historical inaccuracies.